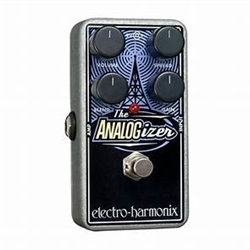 The Electro-Harmonix Analogizer analog saturation/boost pedal is your cure for lackluster tone. The Analogizer's analog circuit path is designed to sound like the front end of a vibrant analog delay pedal, just without the long delay times. A shorter delay time (3.5ms to 65ms) is used to make subtle tonal variations or thicken up your sound. You also get up to 26dB of boost to hype your signal further. The real magic of the Analogizer is its ability to add body and glow to any signal you run through it. It's great for beefing up your tone, but it truly excels at the end of a chain of effects pedals, especially digital effects. The Analogizer analog saturation/boost pedal will add some magic to your tone!